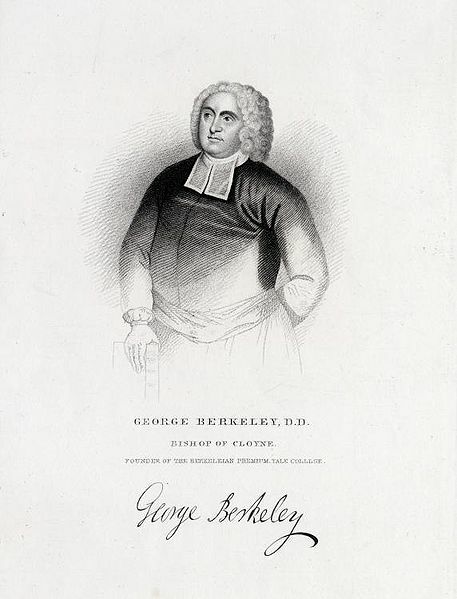 George Berkeley was born in Ireland in 1684, educated at Trinity College, Dublin, and ordained to the priesthood in 1721. As Dean of Derry, beginning in 1724, he developed an interest in the churches in colonial America as well as concern for the conversion of Native Americans to the Christian faith. He sailed for America, reaching Newport, Rhode Island, in January, 1729, settling on a plantation nearby, Whitehall, while awaiting the resources to start a college in Bermuda. When his plans failed, he gave Whitehall and his personal library to Yale College and returned to Ireland where he became Bishop of Cloyne in 1734. Berkeley College at Yale, Berkeley Divinity School, and the City of Berkeley, California, are named for him. Berkeley was a major philosopher of his time and among his achievements was the theory of immaterialism—individuals can only directly know objects by the perception of them—an idea that would inﬂuence Hume, Kant, and Schopenhauer. Joseph Butler, once called “the greatest of all the thinkers of the English Church,” was born in Berkshire in 1692, into a Presbyterian family. His early education was in dissenting academies, but in his early twenties he became an Anglican. He entered Oxford in 1715 and was ordained in 1718. 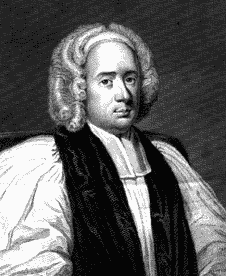 Butler distinguished himself as a preacher while serving Rolls Chapel, Chancery Lane, London, and then went on to serve several parishes before being appointed Bishop of Bristol in 1738. He declined the primacy of Canterbury, but accepted translation to Durham in 1750. He died on June 16, 1752 in Bath, and his body was entombed in Bristol Cathedral. Butler’s importance rests chieﬂy on his acute apology for orthodox Christianity against the Deistic through prevalent in England in his time, The Analogy of Religion, Natural and Revealed, to the Constitution and Course of Nature, 1736. He maintained the “reasonable probability” of Christianity, with action upon that probability as a basis for faith. Butler’s was a rational exposition of the faith grounded in deep personal piety, a worthy counterpoint to the enthusiasm of the Wesleyan revival of the same period. I Holy God, source of all wisdom: We give thanks for thy servants George Berkeley and Joseph Butler, who by their life and work strengthened thy Church and illumined thy world. Help us, following their examples, to place our hearts and minds in thy service, for the sake of Jesus Christ; who with thee and the Holy Spirit liveth and reigneth, one God, for ever and ever. Amen. II Holy God, source of all wisdom: We give thanks for your servants George Berkeley and Joseph Butler, who by their life and work strengthened your Church and illumined your world. Help us, following their examples, to place our hearts and minds in your service, for the sake of Jesus Christ; who with you and the Holy Spirit lives and reigns, one God, for ever and ever. Amen. Is “Deistic through” perhaps a typo for “Deistic thought”? Also, why in the heading is “George Berkeley and” in brackets? My sense of punctuation and grammar tells me if there is a reason for these brackets, then like [ ]s should enclose the plural endings and added year conditioned on the prefixing of Berkeley, i.e. be much easier to read, to grasp, to fathom? Haruo — The square brackets are used provisionally on this blog (and in the print edition of the book) merely as an indicator of those who have been added to the calendar only on a trial basis. In today’s commemoration Joseph Butler (no brackets) has already been finally approved for inclusion. George Berkeley, by contrast, was only approved for trial use in a shared commemoration with Butler, and thus his square brackets. They could have used any style feature for this purpose, but the square brackets “won.” At the next convention those now printed with brackets who receive final approval will be printed subsequently without brackets. Others now with brackets, who do not receive approval, will not appear at all. At least, to date that is how it worked. It is conceivable to me (although unprecedented) that some could be re-approved for further “trial” work (editing, fact checking, etc.) in which case they would still be on a trial basis, and still have to lug those brackets around for another three years to see what happens at the subsequent convention. That’s why the brackets are only placed around the name. Thanks, John. I came to this blog belatedly and without much specific preparation (I’m not even Episcopalian, but Baptist); I’ve only been following it since St. Zinzendorf’s Day ;-). So long as the strange use of brackets is provisional and not intended to be carried over into the permanent edition, it now makes sense to me and I relinquish my objection. And it seems to me that it makes at least as much sense to let George and Joseph share a feast as Ss. Peter and Paul, which I gather is long established. Again, thanks for the explanation. Thanks for the response about “enthusiasm,” John M. I just wonder if it conveys what it is meant to convey in today’s parlance. About the collect — after the point made in the narrative about the “reasonable probability” of Christianity, and the “worthy counterpoint to the enthusiasm of the Wesleyan revival,” is it at least a wee bit disingenuous to pray that “following their examples” God might “place our hearts and minds” in his service? The “deep personal piety” is hard to imagine in a merely probable relationship, and I’m not sure what role “heart” plays in “rational exposition.” I’m not faulting them for what they did, I’m suspicious of how we’re representing it in our collect and in our narrative. A second response, — where it mentions they “illumined your world,” — that seems like an overestimate. Would you consider, “helped illumine your world”? It doesn’t seem to me they fully did so — but I could just be whistling in the dark about that. I believe it’s the case that although Butler was addressing Wesley, it was Whitefield’s excesses that prompted his remarks. I point this out because a) it’s important to note the differences between Wesley and Whitefield, of which Butler (like many others to this day) did not seem to be fully aware, and b) otherwise there might be thought some reason not to have both Wesley and Butler in HWHM. I’ve already argued against having any commemoration of Whitefield, and am glad to have Butler’s support (even if I’m not convinced he should be in HWHM either!). Phillip, I support having both Butler and the Wesleys in HWHM, even if it does exhibit cognitive dissonance on my ,part. I believe Wesley himself came to view Whitefield as “excessive,” and I agree with you that he doesn’t belong on the EC’s calendar, but then I don’t believe any Calvinists belong on our calendar, including John Calvin. Oxford movement attempted to hide or even erase the Calvinist traditions within the Anglican communion. If I have offended anyone here, I ask your pardon. Again, there ought to be a pronunciation guide. BARK-lee. Everyone does not know that. I have tried for years to get the correct pronunciation for Aelred of Rievaulx and come up with a considerable variety. The last paragraph of the Butler bio has a typo: “through” should be “thought.” Also, saying that Butler provided a counterpoint to Weslyanism hardly catchess the immense irony that it was Bulter, the great defender of Christian orthodoxy against Deism, who was in fact (according to Wesley’s recounting of an infamous interview) the one who bears responsibility for driving Methodism out of the C of E.
I realize that Butler and Wesley disagreed about many things, but since Wesley died an Anglican clergyman, and the English Methodist Church was not founded until after Wesley’s death, and decades after Butler’s death, isn’t it a bit of a stretch to say that Butler is responsible for driving Methodism out of the C of E? Will someone without a seminary education understand the biography of Joseph Butler? I think not. Too much ecclesiastical jargon. Butler was already in the Calendar. Berkeley is new. Only the Psalm is from the previous commemoration. The Hebrew Scripture reading, New Testament reading and the Gospel reading are new. Oh, and the Collect is new, too. Butler’s former collect (see below) was the Common ‘Of a Theologian and Teacher’, prayer 1 (page 248, BCP). I actually like it better than the new one composed for both Berkeley and Butler. O God, by your Holy Spirit you give to some the word of wisdom, to others the word of knowledge, and to others the word of faith: We praise your Name for the gifts of grace manifested in your servant [Joseph Butler], and we pray that your Church may never be destitute of such gifts; through Jesus Christ our Lord, who with you and the Holy Spirit lives and reigns, one God, for ever and ever. Amen. Bio: They need ‘Who they are’ and ‘Why they are is important’ statements. As a proud alum let me add that the name of Berkeley Divinity School in New Haven, Connecticut, is now Berkeley Divinity School at Yale. Characterizing Berkeley’s philosophy as if it were only about perception, knowledge, or epistemology, ignores his speculations about the metaphysical nature of reality as also immaterial. That was an important vein of philosophic history, and deserves not to be suppressed — assuming ANY characterization of his philosophic writing is required here. John LaVoe is right to question the use of the word ‘enthusiasm’ in this bio. Its meaning today is so different from its meaning in the 17th and 18th centuries that another word should be found. Perhaps better to rephrase it entirely—‘his emphasis on reason was an appropriate’ (rather than ‘worthy’—what exactly can that mean in this context?) ‘counterpoint to Wesley’s emphasis on emotion’. plain, rather untutored Episcopalian, I would ask that terms which have specialized meaning please be rendered into standard English. What is wrong with saying that Joseph Bulter declined appointment to the position of Archbishop of Canterbury, but did become the bishop of Durham? The word “translation” to me means three things. intended. Please leave out the jargon unless you want your parishioners to find humor where none was inteneded. I (a layman) knew about translating bishops and relics, but (as a non-scientist) not about translating DNA, so perhaps jargon of whatever variety should be avoided. Yes. “Translating” bishops is actually fairly common usage in England, where it is (or at least was) a frequent occurrence. It makes sense if you consider bishops to be a species of civil servants, and promotion from a suffragan appointment to a modern diocesan see to an ancient diocesan see to the archbishopric to be a normal episcopal curriculum vitae. The English do it, as do the Romans, but it’s not really very Catholic. We mostly don’t do it (although a suffragan bishop can be elected as diocesan in another diocese). I certainly agree that we need to be cautious about using “in” expressions. Suzanne, — I’m a clergy (although some people have other terms for me) and your comments are great. I’m all for plain, clear language — why, sometimes I even use some myself! 🙂 The only reservation I had in the comments was when “presbyter” was challenged, and I felt it needed to be accepted because it is a basic term in (for example) the BCP ordination service (I think it’s in there three times in the ordination service for a priest — if you count the rubrics as well as the “script”) and it is also used commonly in Canon Law, to name two places I would consider significant. (I don’t remember that it was you who raised that, and I don’t think I made an issue of it when it came up.) Anyway, this clergy (and, I believe, most and maybe all clergy in here) aren’t laughing at anything you’ve said. Truthfully, I sincerely thank you for what you’ve contributed — it informed me a lot — (ditto to you, Steve) — and I hope you know it is, and was, beneficial to the discussions — beause it was! I just read an article on Butler that confirms my suspicion that he doesn’t belong here, even though I love his ‘horrid thing’ remarks and would love to quote them personally to those currently leading the Episcopal Church in its opposition to New testament standards of sexuality. The article (Joseph Butler, Laodicaean Rationalist?’ in Modern Language Studies Vol 4 by Clifford Johnson) points out that Butler’s Analogy of Religion is hardly read these days, and in any case ‘Butler’s spiritual complexion is pallid. He is far from the ringing affirmations of any of the scriptural writers. Having come to the end of his book, he says “the general scheme of Christianity, and the principal parts of it, are conformable to the experienced constitution of things, and the whole perfectly credible: so the account now given of the positive evidence for it shows, that this evidence is such, as, from the nature of it, cannot be destroyed, though it should be lessened” (p. 240). A man who admits that the evidence for his faith can even be lessened would seem to lack some of the qualifications for sainthood… in agreeing to fight with the enemies’ weapons, he gives up half the battle. Butler may defeat the deists on their own ground, but in agreeing to justify Christianity by appealing to the religion of nature, he admits a rationalistic methodology which is potentially dangerous to Christian teaching. His book’s greatest strength is also its greatest weakness. Stephen significantly praises Butler not for his faith, but for that characteristic Victorian virtue, his “deep moral earnestness,” a quality not specifically Christian (p. 235)’. An unworthy corrective to the emotionalism of Whitefield and his modern imitators, I’d say. Line 1, first paragraph: add “Thomastown,” after the first “in”. Line 1, first paragraph: substitute “March 12,” for the second “in”. Although the present text shows the year of birth as 1684, this was probably “old style”, and many other sources show the year as 1685. I suggest we should use the later year throughout. Line 2, fourth paragraph: substitute “, England, on May 14,” for “in”. Line 3, fourth paragraph: I suggest putting “dissenting” within quotation marks. That term for “non-conformists” will be unfamiliar to many readers. Line 4, fifth paragraph: I suggest substituting “office of Archbishop” for “primacy”. Many readers will not understand the meaning of “primacy” here. Line 2, sixth paragraph: I suggest substituting “thought” for “through”. Line 8, sixth paragraph: I suggest putting “enthusiasm” in quotation marks, because the word reflected at that time a pejorative sense of excessive piety, no longer current.